Dan Moore is an innovator as well as a businessman, so when his glass transporting fleet — one of only a few such specialized haulers in the U.S. — ran into a problem, he wasted no time figuring out how to solve it. In his case, the answer was crystal clear: Change his mixed fleet to all Mack®. His decision to fill his yard with 140 Mack Pinnacles™, saved not only money but, possibly, his business. Moore Freight Service was founded in 2000 in Mascot, Tennessee, near Knoxville, with little more than some cubicles, a fax machine and a solid business plan to serve the glass manufacturing industry. Initially the fleet was only one truck and two owner-operators. Before long, word of his experience in the glass industry spread, and soon he was buying more trucks and hiring more drivers. Today, Moore Freight has 140 company drivers and 25 owner-operators. They specialize in transporting crated and uncrated flat glass, which ranges from 2.2 millimeters to an inch thick. It is a highly exacting business that suits Moore — and his Pinnacles — well. The biggest challenge is getting the shipments quickly and safely to the vendors, without breakage or workplace injuries. Moore required reliable equipment, a consistent drawback of operating the mixed equipment fleet. Glass is a seasonal business, peaking in spring and summer, when housing is in high demand. Natural disasters also create a spike in glass usage. 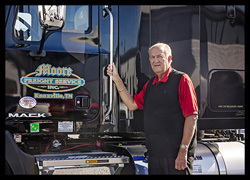 When business is booming, trucks must be rolling, but with its aging mixed fleet, Moore Freight could barely keep trucks on the road. “That’s not exactly confidence inspiring,” agrees Jim Toussaint, Division Operations Manager of Worldwide Equipment, a Mack dealership and certified Mack Uptime Center in Knoxville. In 2010, when he met Moore, he found a frustrated businessman in need of a solution. “He told me, ‘I don’t care about fuel economy. I don’t care what color they are. I don’t care what they look like. I need something that’s going to run, because if it doesn’t run, the rest of it doesn’t matter,’” Toussaint recalls. 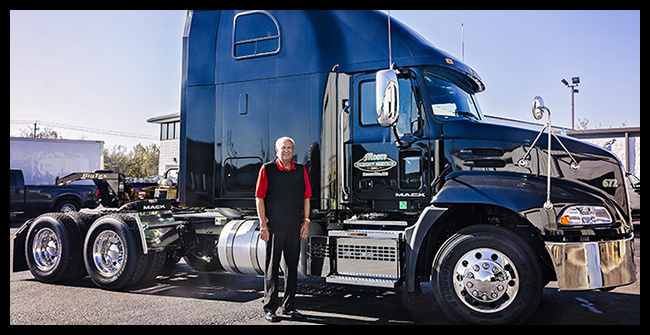 Together, Moore and Toussaint created a new, all-Mack fleet, complete with GuardDog® Connect and extended coverage plans, which provide beyond-warranty coverage for the engine, exhaust system and air conditioning components. Moore’s current fleet averages 2.5 years old and consists of Mack Pinnacle 70-inch double bunk sleepers, running 13-liter MP®8 Super Econodyne 445 hp engines, with 1,860-lb.-ft. of torque and a 2.64 rear-end ratio. They are also outfitted with mDRIVE™ transmissions and air suspension. Moore’s previous fleet’s fuel usage averaged 4.5 miles per gallon, but his Macks give more than 8 mpg. Maintenance costs plummeted also, from 30 cents per mile to 11-12 cents per mile. Improved safety features were another important factor when Moore decided to go with Mack. Every driver completes a one-week class at a glass plant, where they learn the intricacies of hauling glass, from how to load it, how to offload it and where to stand. The mDRIVE helps with safety, especially in rough terrain; Moore Freight delivers to 48 states as well as Canada, and drivers see a wide range of road conditions. Another advantage: Moore no longer worries about uptime. With GuardDog Connect, drivers are alerted to potential problems sometimes before they are even aware of them, and they are routed to the nearest dealer for repairs. Moore receives the alerts, too, making him aware of not only the problem, but also an estimate on the repair time. The cost savings has enabled Moore to improve his driver recruitment and retention rates by increasing their mileage reimbursement to 65 cents per mile, offering bigger bonuses and spec’ing tractors with premium seats and trim. The drivers are worth it, Moore says. They average more than 500 miles per day and are the backbone of the company. 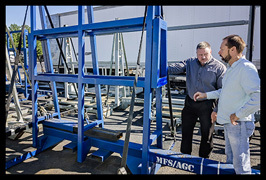 Moore seeks ways to improve the customer experience, talking with them about their needs and, when necessary, creating custom, patented products like his latest invention — a special system that allows racks to be preloaded with glass, driven into a custom 45-foot trailer and dropped off at a customer’s dock for offloading at their convenience. The new system cuts down on the potential for driver injuries and gets them back on the road quicker. Normally, a driver would have to wait two to three hours for a shipment to be offloaded, and everyone at the plant would have to stop what they were doing to handle the shipment. Now, drivers can be in and out within 15 minutes. 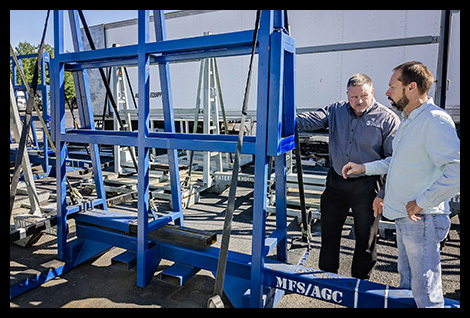 Moore’s fabrication shop has built 200 racks and intends to build more as their customers continue to embrace the new concept. Using drive-ins instead of curtain side trailers saves money on the equipment purchase as well as the maintenance. Because glass is such an expensive industry, every dollar saved helps. And Moore intends to stay in the business for a long time. Moore Freight has rapidly grown from a $100,000 annual revenue to more than $40 million, and they are regularly listed among Inc. Magazine’s annual list of the top 5,000 fastest growing private companies in the country. And all Moore plans to use in the future is Mack. He already has his eyes set on Mack’s newest model, the Mack Anthem™. He also intends to continue his business relationship with Toussaint at Worldwide Equipment. He attributes his success to not only his equipment but also his drivers and staff.